Under the auspices of the Student Activities Department, the faculty of Financial and Administrative Sciences organized a charity market in the entrance foyer of the faculty on Tuesday 28/3/2017. 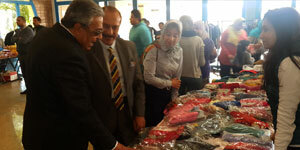 The charity market was opened by Prof. Ramadan Abu El-Ala, the Vice President of Community Service & Environment Development Affairs and Prof. Tarek Taha, the faculty Dean. The event was held under the supervision of Dr. Najwa Mohamed, the Leader of the faculty student activities, with an ample participation on the part of the students in the organization of the event. Some faculty members and teaching assistants attended the event as well.